Most people like to receive welcome emails. Why? Because they make them feel part of something—they mark the start of a new friendship, as it were. Research from Return Path shows that those who read at least one welcome email read over 40 per cent of messages from the sending brand during the following 180 days. However, unfortunately for ecommerce marketers, it’s not just a case of firing off any old automated message. No. When it comes to welcome emails, there’s an art to getting it right. To give you an idea of how it’s done, we’ve deconstructed American womenswear brand (and part of Ann Inc.) Ann Taylor’s welcome series below. 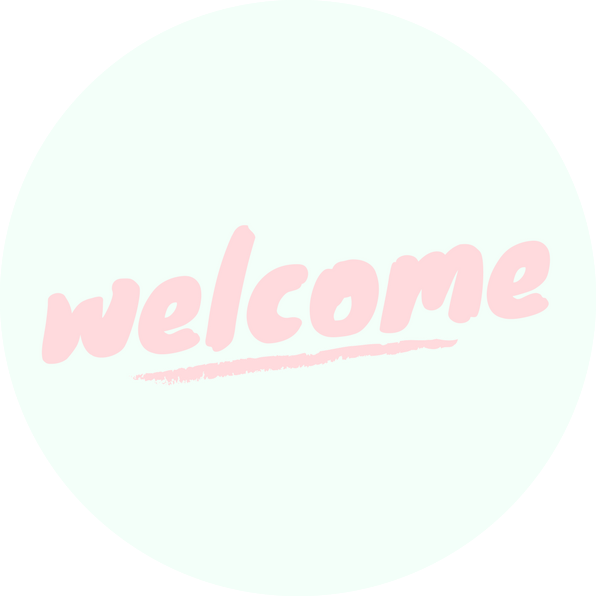 As no one brand is ever going to encapsulate all of the best practices you can try, we’ve added an extra section to the bottom of this post listing more welcome series tips and ideas. 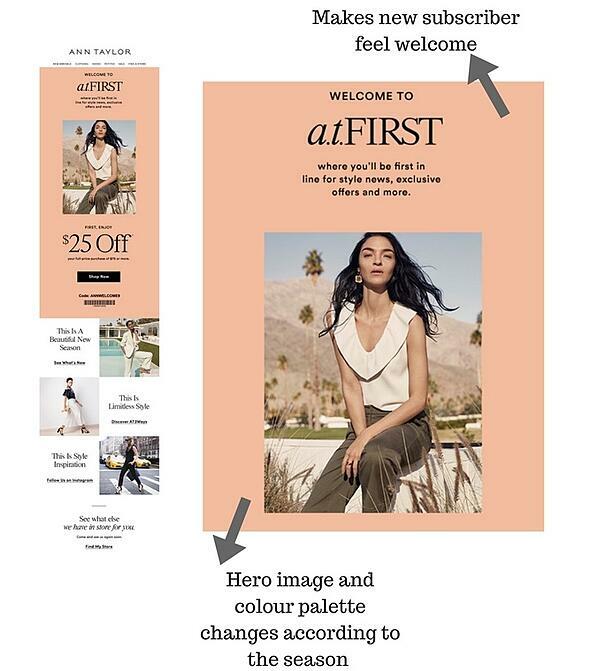 The first email a new subscriber receives from Ann Taylor reads “Welcome to a.t.FIRST”, followed by a brief summary of what they can expect now they’re a member. This message is accompanied by an image of a model wearing Ann Taylor garments and looking straight at a recipient, as if to say "hello". Both the colour palette and hero image of this email are notably summer-y, showing the brand tweaks its triggered messages according to the season. 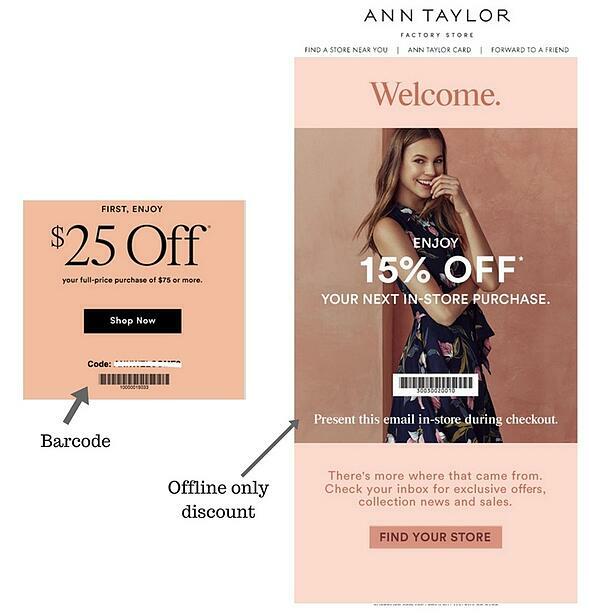 Described in the email’s subject line as a “gift”, Ann Taylor goes on to offer newbies a generous first-purchase discount (as shown in the email above). If any inspiration is needed as to what to use this voucher on, a link to the brand’s latest collection can be found directly below it. Now for the cool part. If a recipient doesn’t use this discount straight away, a reminder email is sent just over a week later. 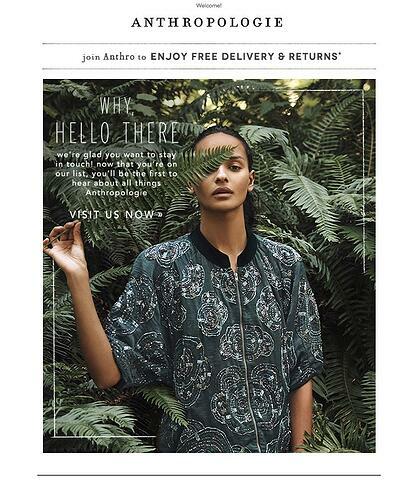 This is a very good example of a brand using behavioural data to tailor automated messages. Interestingly, the discounts mentioned above include a barcode, showing they can be used offline as well as online. 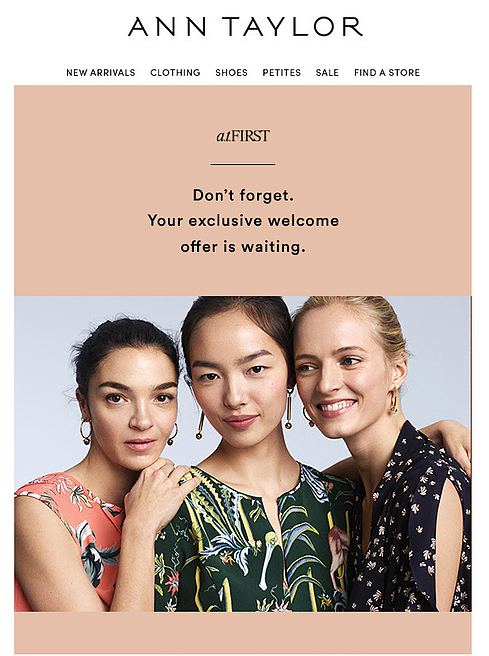 Just one week after welcome email number one, a new subscriber is sent a second email—this time offering an “exclusive” offer to be used solely in-store. This is a great way to appeal to new contacts that prefer to shop offline, as well as encouraging more offline store visits. 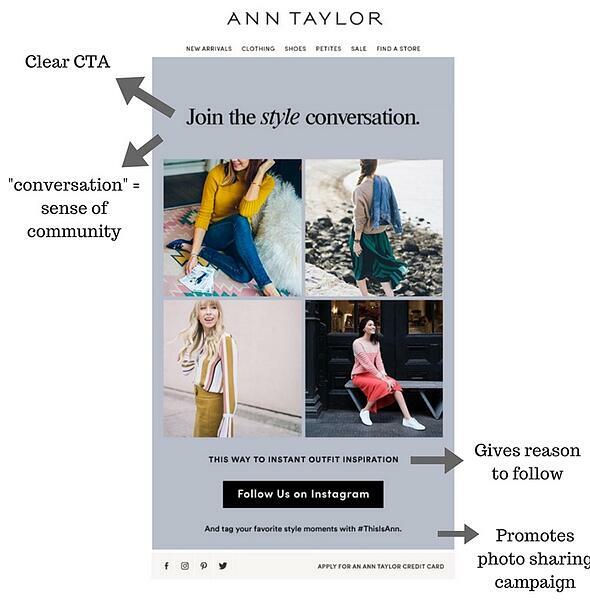 In its very first email, Ann Taylor features a call-to-action (CTA) inviting readers to follow them on Instagram for “style inspiration”. 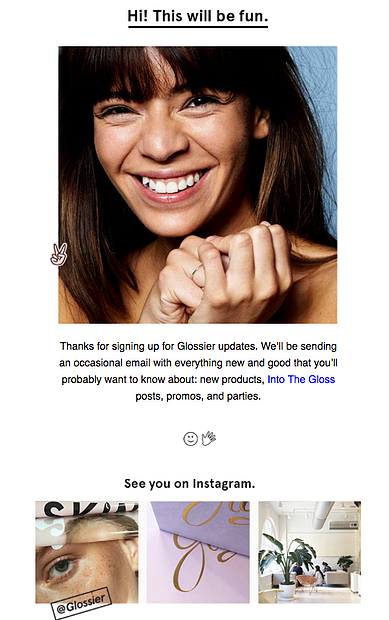 This social calling is followed up just under a week later, when the brand sends a dedicated mail out with the subject line “Join the AT Social Life” and preview text “Follow Along!”. 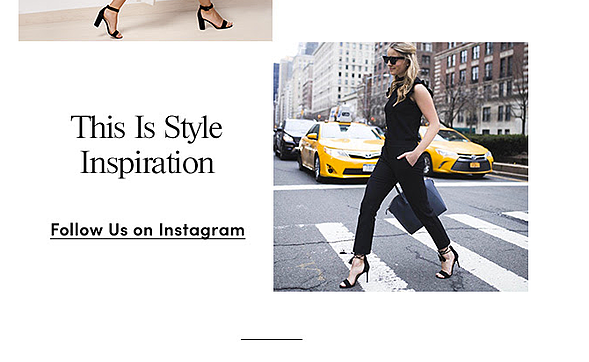 This email again invites a new subscriber to “join the style conversation” by checking out the brand’s Instagram. It also includes a cheeky CTA asking those active on this channel to “tag their favourite style moments” with the hashtag #ThisIsAnn. Reason Five | and even makes a note of your birthday! Perhaps our favourite email of the series, this triggered message waits four days after a sign up before emailing them to ask: “When’s your birthday?” This is a great way for Ann Taylor to collect customer data at an early stage which can be used to power future birthday emails. With nice typography, a very cool candle gif and the promise of a “special gift”, this welcome email really is hard to ignore. 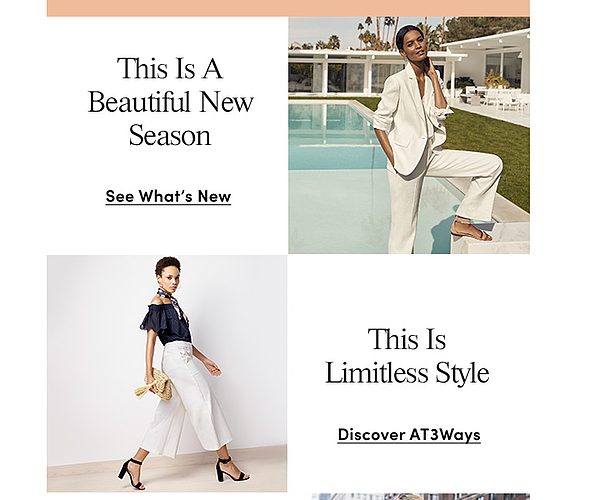 With a navigation bar linking back to the website at the top of each email and a banner at the bottom promoting “Ann Taylor Credit Card”, this welcome series is pretty good. However, a little more personalisation would have gone a long way. If a subscriber has only just signed up to your emails, the likelihood is you only know their name. If you can, use this in your welcome series—it’s a small thing but can go a long way. If you have any browsing/interaction data, you can also use this to include product recommendations in your welcome series. Top tip: Try segmenting your subscribers by those who have actually made a purchase. This will enable you to tailor the message according to the item they've bought or, for example, omit a discount as they've bought recently. Make it clear who the email is from and why you’re sending it: Use the subject line and preview text to your advantage. Just because someone has subscribed to your brand, it doesn’t mean they’ll remember you straight away. Our advice is to be clear rather than cryptic. Say thank you: It's always worth thanking your contacts for signing up to your newsletters, because without them you wouldn't have anyone to send them to. Acnowledge that they're proactively opting in to hear from and about your brand, and that this means a lot to you. Don’t just focus on your product: Once you've established the purpose of your welcome email through the subject line and preview text, you can use the content of your email to have a little more fun. For example, instead of just focusing on your product, you could create a lifestyle recipients can aspire to, or take the opportunity to communicate your core brand values. Be discerning with your hero image: The other thing to do is to use cool photography - especially if you’re a retailer offering things that are aesthetically pleasing (e.g. a stationary brand focusing on pretty designs or a fashion brand known for its funky styles). Tell them what to expect: In case someone has signed up to your emails without really knowing what being subscribed will involve, offer an overview of why they've made the right choice (or, if they've been automatically opted in, why they should stay subscribed). Screenshots from: Glossier and Lancôme. If you’re wondering how to improve (or get started with) your welcome series, check out our welcome series guide. 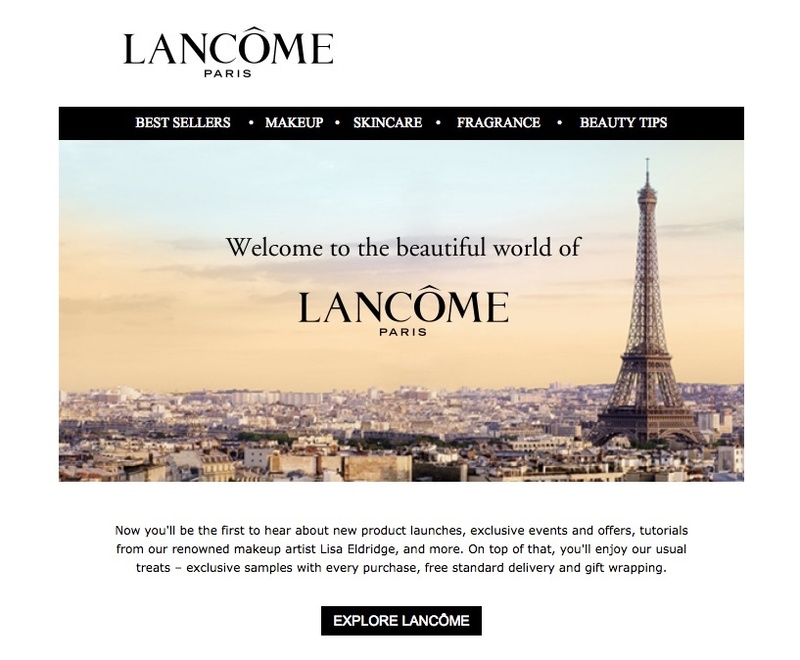 Battle of the beauty brands - who's smashing the welcome email? To learn more about how Ometria can help you with your email automation, please request a demo here.